The most popular and successful British drama series in television history, Upstairs, Downstairs won seven Emmy® Awards, a Golden Globe®, and a Peabody. This epic saga of life and love in Edwardian England captivated viewers for five heart-tugging, humorous, and satisfying seasons. For nearly 30 years, the wealthy Bellamys and their loyal servants shared a London home, surviving social change, political upheaval, scandals, and the horrors of WWI. The excellent ensemble cast includes Jean Marsh (Agatha Christie s The Pale Horse), David Langton (The Spoils of War), Gordon Jackson (The Professionals), Simon Williams (Sword of Honour), Lesley-Anne Down (North and South), and Nicola Pagett (Anna Karenina). 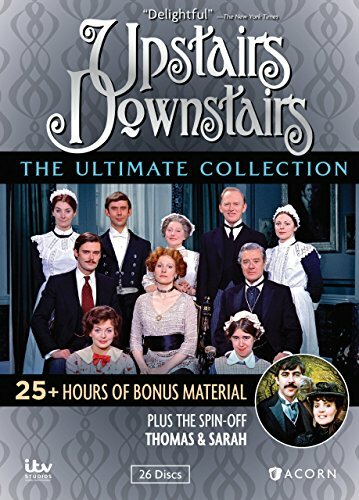 Return to 165 Eaton Place with this ultimate collection that includes the complete Series 1-5, hours of bonus material, and the popular spin-off series Thomas & Sarah, starring real-life couple John Alderton (Calendar Girls) and Oscar® nominee Pauline Collins (Shirley Valentine). If you have any questions about this product by RLJ/SPHE, contact us by completing and submitting the form below. If you are looking for a specif part number, please include it with your message.